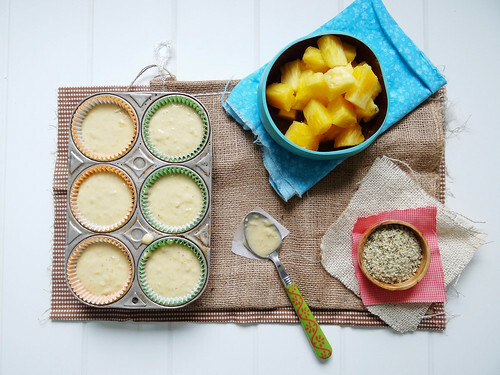 fresh pineapple & hemp oil are the main flavors of the cupcakes. thankfully i only made 6 cupcakes - they were addicting. i adore the color of the butter cream from the strawberries - with color like that there is no excuse not to use natural food colorings. 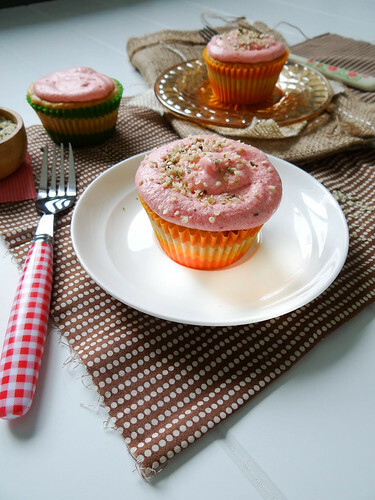 the hemp seeds and oil add a layer of healthy goodness that amps up the nutritional value of these cupcakes - but lets stay real here, they are still cupcakes just a tad healthier. line a cupcake pan with liners. 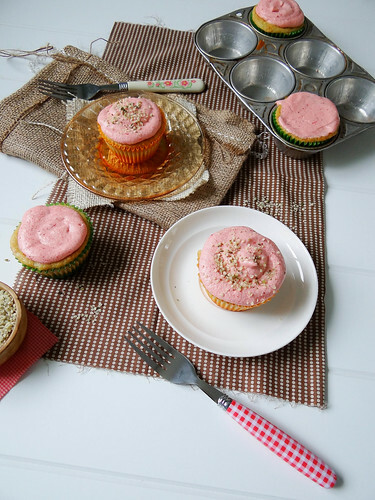 fill cups 2/3 full - bake in oven for 20-25 minutes or until a cake tester comes out with a few moist crumbs when tested in the center of the cupcake. remove from oven and allow to fully cool on a cooling rack. 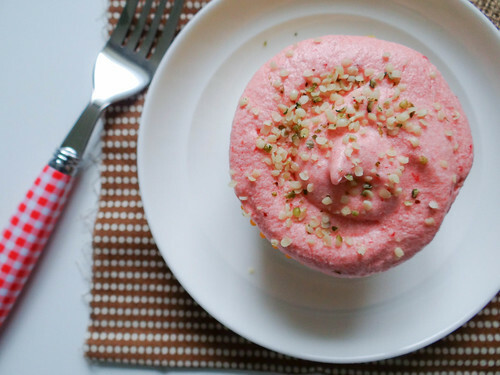 while cupcakes are cooling, make frosting. using a stand mixer or hand mixer, mix butter and confectioners sugar on low speed, add in strawberry puree or jam a tablespoon at a time, lastly mix in vanilla. frost by hand or use a piping bag....i used a Ziploc baggie and cut the corner off. 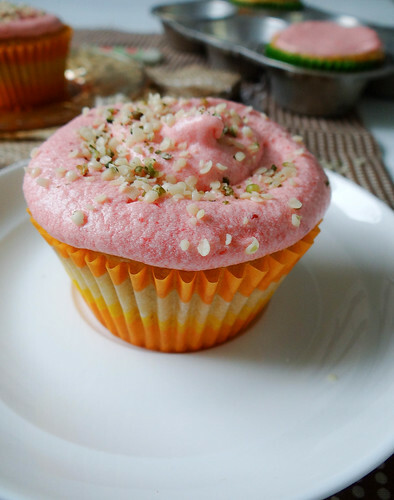 sprinkle with hemp seeds. ahhah pineapple express! Great one. These looks so delicious. I saw the movie and thought it was really funny. That was exactly my reasoning behind making only 6...with only Justin and I in the house it is way too easy to end up eating all 12 cupcakes between the two if us! pink and brown are my favorite color combination, too!! and, coincidentally, i always fall asleep mid-pineapple express, too. we have the blu-ray and a swear one of these days i will watch the WHOLE THING. 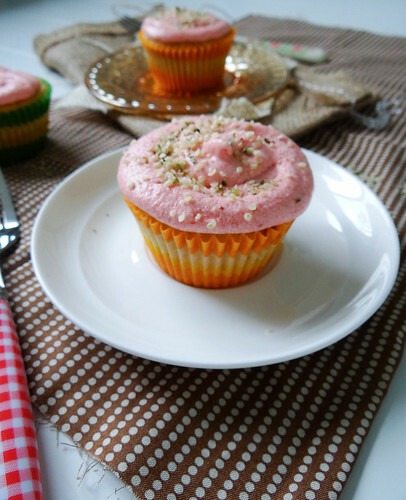 i absolutely love that you used hemp seeds as a topping! also, i love the pink frosting. once i tried mixing strawberry jam into vegan buttercream and it ended in disastrous, runny, wet frosting that needed to be thrown out. i wonder what i did wrong..
We had the blueray at one point to....however Justin has a habit of selling thingd on e-bay that he feels have been "hanging around" for too long, primarily to make more room for new blue rays - so needless to say pineapple express has found a new home :) lets hope Netflix has it on the instant que ..... 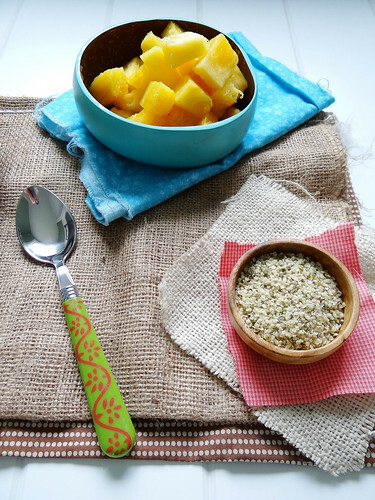 I LOVE hemp seeds, they are so good! Oh my gosh, are we on the same wavelength or what? 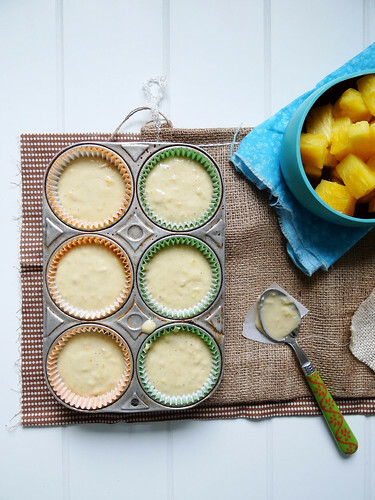 I love pineapple, and these cupcakes sound. so. good. I don't have any hemp oil on hand, but wonder if I could substitute coconut or other oil? love that pink frosting top shot... soooooo prettyyyyyy! i am allergic to pineapple, so i am going to make some frosting and eat it all up and keep the cupcakes for hubbs and tell him, this is how they are supposed to be.. frosting less;) and i love that fork! The fundraiser is now live! http://hobbyandmore.blogspot.com/p/fundraiser-for-vspca.html and also on the fb page. do drop and share if you have a minute! :)) Thanks a bunch! I love the way you think Richa! The entire batch of new silverware is all funky, I love it!!! Can't wait to check out the fundraiser- you have done a phenomonal job- three cheeers for you! Haha! I laughed a little too hard at your explanation of the name for these cupcakes (which are absolutely beautiful, by the way). I saw that movie a long, long time ago. You were one lucky girl and your Mom was well ahead of the trend - I would have loved to have had a pink and brown bedroom, too awesome! I want to eat a huge bucket of this icing NOW. *hehe* Looks fantastic Heather. Such pretty cupcakes. Love the name of the cupcakes. So cute! I saw that movie in theatres and it was quite funny! 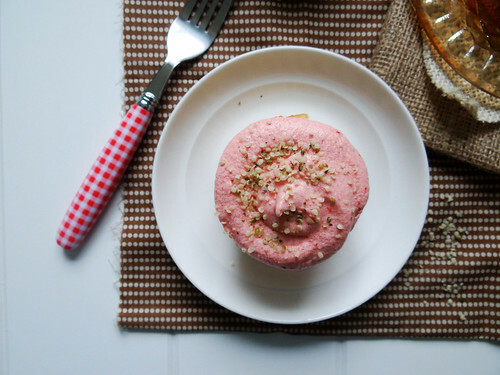 You and Richa should totally getogether and have a strawberry frosting party - you both have the same idea! Awesome post as well :) - I have heard to this movie too! They were super cute & super good; they didn't last long! Ha, I love this recipe name! The recipe sounds like a great combination of ingredients, so I guess I need to bake up a batch and watch the movie now. Thanks Matt - enjoy the movie and the cupcakes...thanks for the pin on pinterest! That first picture is totally to die for! Beautiful, friend. And you topped these beauties with hemp seed? Laughing so hard over your cleverness. Perfect! Clever right :) These cupcakes are just as beautiful as you! So true- 6 cupcakes was the perfect amount for the 2 of us! 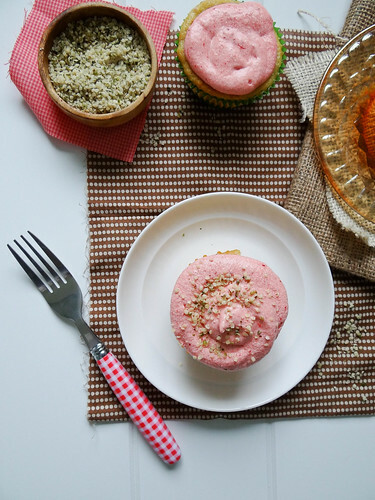 I love the use of hemp seeds as sprinkles! Maybe when I make cupcakes, I could use flax or zest? All I need now is some pineapple! Love the use of pineapple. Mmmmm for cupcakes! And I agree, pink & brown so pretty. Mmmmm for cupcakes is right, who doesn't love cupcakes! Wow these seem easy to make and delicious. Not only am I trying to learn how to bake I wanna bake as healthy as possible and that's what a lot of vegan recipes are. I will be checking back often. Pineapple and strawberry sounds delicious together, but does the hemp oil not cause any flavoring? 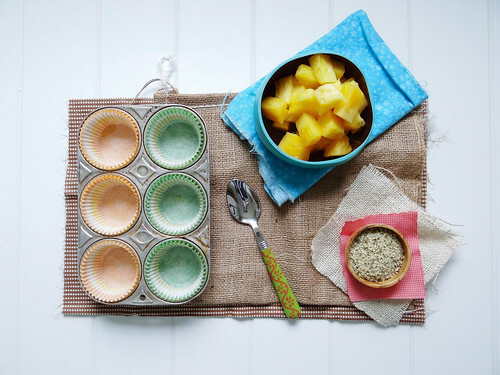 The Hemp Oil does not overpower the cupcake - it really is there to provide moisture along with the pineapple - strawberry & pineapple are amazing together! I love small batch recipes. Love, love, love! 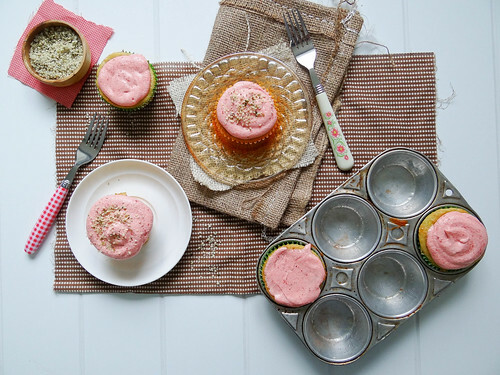 And I love that you coined these "pineapple express cupcakes" - adorable! Now I'll have to watch the movie. We love this recipes. Recipe and photos are fantastic. Thank you for stopping by and for the lovely compliment! Your cupcakes are great. Pictures are also very vivid.